Back in the 50s and 60s, my grandfather was a serious rally and ice-racing fanatic, running Porsche 356s, Porsche-powered Beetles, and Saab 93s. 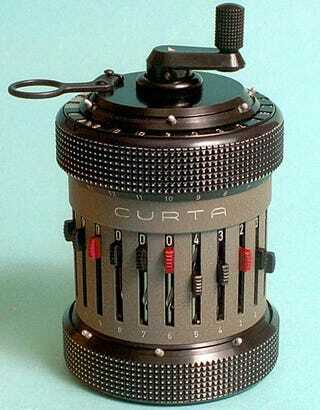 The well-equipped rallyist in those days used the incredibly intricate and beautiful Curta Calculator, also known as the "Peppermill," to do the necessary time/distance calculations during races. My grandfather, who worked as an engineer to support his racing jones, got so geeked out on his Curta that he insisted on using it to do calculations at the day job as well, even after electronic calculators had become the norm. And now he has given it to me! Life is good.